Nitra is a city in western Slovakia, situated at the foot of Zobor Mountain in the valley of the river Nitra. 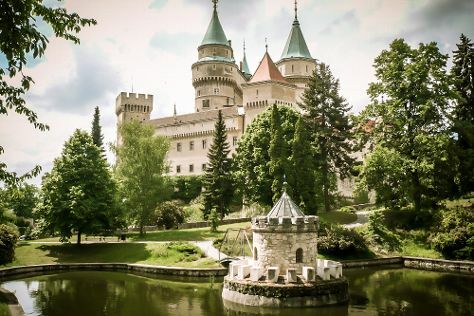 Step out of the city life by going to Bojnice Zoo and Bojnice Castle. Explore Nitra's surroundings by going to Spas & Wellness (in Piestany) and Banska Stiavnica (Open-Air Mining Museum (SMM), Old Castle Banska Stiavnica, & more). There's still lots to do: step into the grandiose world of Nitra Castle, stroll through Park na Sihoti, and pause for some serene contemplation at Church of St. Michael the Archangel. For more things to do, reviews, photos, and more tourist information, read Nitra travel guide. Use the Route module to see travel options from your home to Nitra. In July, plan for daily highs up to 32°C, and evening lows to 19°C. Finish your sightseeing early on the 19th (Tue) to allow enough time to travel back home.